India is known for its rich cultural legacy. Performing arts like classical dances are integral parts of Indian culture. This is a mega-post which cover the details of all classical dances in India. Most of the classical dance forms originated in temples. Worshipping was the main aim. Although every dance form evolved from different regions, their roots are the same. The roots can be traced from the Sanskrit text – ‘Natya Shastra’. The first compilation of Natya Shastra is dated between 200BCE and 200CE. As time passed, artists improvised many classical dances which resulted in the present day forms. Today, Indian classical dances are very popular dance all over the world. Note: Later Abhinav Gupta added a ninth one to it, Shanta: Peace. A dance that encompasses Bhav, Rag, Ras and Taal is ‘Bharatanatyam’. Also called as ‘Sadir’, it was conventionally performed by Devadasis (girls offered to God in the temple) in Hindu Temples of South India. Thus, also known as ‘Dasiattam’. Developed in the Tanjore and other regions of South India prominently Tamil Nadu, this could possibly be the Oldest Classical Dance form of India (around 2000 years old). It follows the convention of Natya Shastra in true spirit. Abhinaya Darpan and Sangeet Ratnakar guide the technique and grammar of body movements. Ra: Rag meaning musical notes. Ta: Taal meaning the Rhythm. Natyam: The Sanskrit word for Drama. Silappatikaram (where its existence was mentioned in this ancient Tamil epic). Brihaddeshwara temple was a major center for Bharatnatyam since 1000CE. The Gopurams of Chidambaram display the poses of Bharatnatyam, chaaris, and Karanas that are carved in the stones. Immense and charismatic makeup (hair as a single bun is tied just before the plaits). The eye-catching costume (bright colored Sari- today the costume comes in 7 pieces that are worn simply, for men – dhoti). Padam – Religious prayer, Bhajan, Keertanam. Carnatic Style, Vocalists Called – Nattuvanar (normally Guru). Verses are usually in Tamil, Telugu, Kannada, Sanskrit. Mridangam, Nadaswaram, Nattuvangam, Flute, Violin veena etc. Rukmini Devi Arundale created a Renaissance. Before her, this art was almost dead. She raised this art form to a Puritan form. Also, T.Balasaraswati ‘s efforts helped to uplift this art form to the form known today. Rukmini Devi founded the Kalakshetra in Adyar and thus gave a new hope to the promotion of this Dance form. The famous Bharatanatyam dancers are Yamini Krishnamurthy, Meenakshi Sundaram Pillai, Saroja Vaidyanathan, Janaki Rangarajan Etc. The graceful dance of North India origin ‘Kathaa’ ‘Kahe’ so ‘Kathak’ ‘Kahave’, the one who tells stories is Kathakaar or Kathak. Also known as ‘Natwari Nrutya’. Kathak is one of the most charming dance forms of India. The themes of Kathak revolve around Stories of Ramayan, Mahabharat, and Krishna. Apart from this, Kathak encompasses presentations on manifold subjects. Raslila of Braj is quite akin to Kathak. A Solo Dance form but group compositions on themes with perfect synchronization steals the heart. Kathak is world famous for its spectacular footwork, amazing spins, Nazakat and Padhant (Chanting of bols, toda, tukdas by dancer himself and then performing). This is the distinctive feature of Kathak. It creates a nexus between the dancer and audience. The body movements are quite straight as compared to Bend movements of South Indian Dances. The heavy ghunghroos are worn by the Dancers – 100/200/250 on one leg. There is a wide variety of sounds are hidden in these ghunghroos like running train, heavy rains, Sound of Horse riding,( Ghode ki chaal) and much more. This adds more beauty to the performance. These are the Jaipur, Lucknow, Raigarh and the Benares gharanas. These schools are named according to the geographical area in which they developed. Each has a slight difference in interpretation and repertoire and can be recognized from their presentations. Starts with Vandana ( Worshipping God). Aamad (sequence of That Aamad Uthaan may be different in different gharanas). End with a Bhajan, Thumri, Tarana or Ashtapadi, Kajri, Chaiti, Chaturang etc. Traditionally, Sari, Ghagra-Choli, Chudidar Frock – Jacket, Dupatta for women and men can wear Chudidar Kurta and Dupatta tied at the waist. This dance-drama may have costumes as per the character. Makeup is not much heavy but is quite sharp and Fine to reflect the expressions. A bun or long plaits with garland looks beautiful. Mostly white—yellow pearl ornaments are used. Hindustani Music: Lyrics may be in Hindi, Brij, Sanskrit or any other regional language. Instruments like Pakhawaj, Tabla, Sarangi, Sitar, Harmonium, Flute, Sarod, etc. are used. The value of this dance form diminished during the Moghul period but still, there were certain good technical changes like inclusion of Thumri in Kathak. The period of Nawab Wajidali Shah was a golden age for Kathak. He himself was a great artist and extensively promoted Kathak. The King of Raigarh Raja Chakradhar Singh who himself was a Kathak dancer gave birth to Raigarh Gharana of Kathak—greatest contribution to Kathak. Achhan Maharaj, Shambhu Maharaj, Gopi Krishna, Pandit Birju Maharaj, Pandit Rajendra Ganagani ji, Sitara Devi, Rohini Bhate, Maya Rao, Mandvi Singh, Shama Bhate, Shovana Narayana and many more artists gave their priceless contribution in Kathak . Kathak Kendra Delhi, a constituent Body of Sangeet Natak Akademi and many other governments and private institutes all over the world strive hard continuously for the training and promotion of Kathak. The long-established dance form in the serene surroundings of Shri Jagannath Temple in Odisha is famous as ‘Odissi’. It has its mention in the oldest Sanskrit Text – Natya Shastra as Audramagdhi. In ancient days this dance form filled with Bhakti ras was a part of worship to God at Jagannath temples. Thus we find many sculptures in dance position inside the temple. It has a combination of Lasya and Tandav. Graceful and mesmerizing, it appears like waves of the ocean. 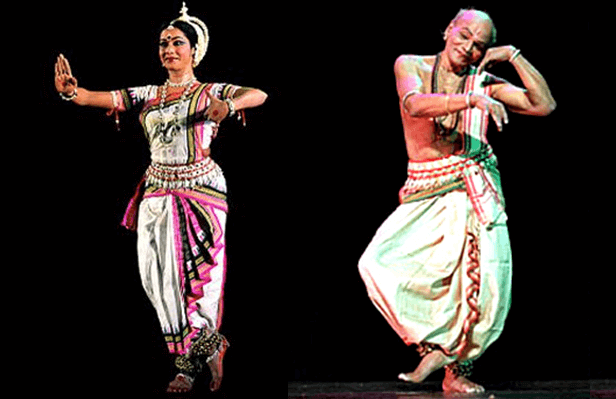 Odissi is famous for its presentations on poet Jayadev’s fabulous work. Maharis (Devadasis or Temple Girls). Gotipua ( Performed by Boys). Managalacharan (Worshipping Lord Jagannath or other gods, goddesses). This will be followed by Pushpanjali (Offering of flowers) and salutation to mother earth. This also includes Trikhandi Pranam- Devas, Gurus, and Rasikas. The next comes the Batu Nrutya—Fast dance pure dance which we call it as Nritta which is then followed by Nritya which include, Abhinay- Expressions on some devotional poems or songs. The verses may be in Sanskrit or Odia language. Ashtapadis—Dashavtar, Ardhanari etc. Are quite famous. Then comes the Dance Drama in sequence. The themes generally relate to the Hindu gods and goddesses. Modern day expressive theme presentations go beyond the horizon. It is made up of traditional material (Dhoti for men- Sari for women) from Odisha. Today fully stitched costume is available. A crown is worn by female dancers which are prepared in Jagannathpuri. White colored flowers are adorned on the bun. Like every other dance form, jewelry remains the same but is of silver colored. Ghunghroos too form part of this dance. The South Indian, as well as North Indian Music, is employed for the dance. The Pakhavaj, Tabla, Swarmandal, Harmonium, Sitar, Flute, Violin, and Cymbals. Kelucharan Mahapatra, Gangadhar Pradhan, Pankaj Charan Das etc.revived this dance form in the late forties and early fifties. Sanjukta Panigrahi, Sonal Mansingh, Kumkum Mohanty, Anita Babu, Sujata Mohapatra etc. contributed to the upliftment and popularization of Odissi. Recently, the Odissi has now been included in the syllabus of IIT Bhubaneshwar’s B.Tech syllabus since 2015. It became the first national technical institute to introduce any Indian Classical Dance form in their syllabus. The Kuchipudi was originated from the place named ‘Kuchipudi’ in Krishna district of Andhra Pradesh around 3rd century BCE, Kuchipudi Dance form is a long-established dance-drama style. Tirtha Narayana Yati and his disciple Siddhendra Yogi organized and founded the modern version of Kuchipudi which we see today. Kuchipudi gradually developed as a solo dance form and today we can see both male and female performing it. Kuchipudi are themes related to Vaishnavism, Lord Krishna, Rukmini, Satyabhama and other myths. 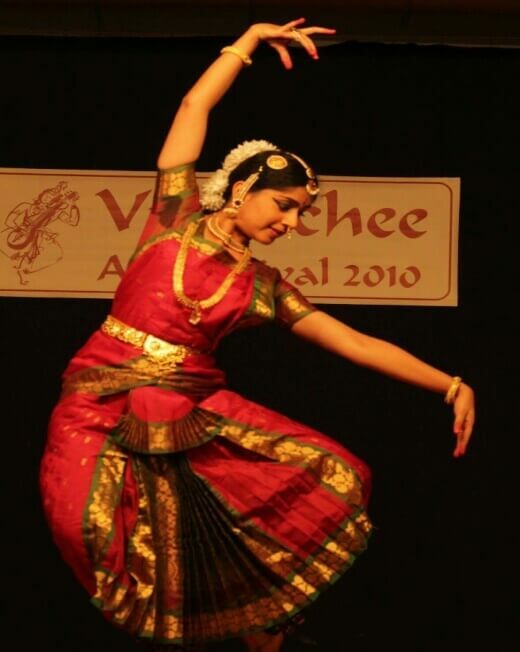 Kuchipudi also holds certain specialties of Bharatnatyam and Odissi as well. Bharatnatyam costume has three fans of dissimilar lengths. While Kuchipudi dress has only one frill/fan lengthier than the lengthiest fan in the former. In Bharatnatyam, there is no side Pallu but in Kuchipudi separate pallu is stitched seen on the left side. Two buns are used in Kuchipudi while only one in Bharatnatyam. Kuchipudi has a specialty called- ‘Tarangam’ in which the dancer performs on the top of the brass plates. And sometimes balances some pot on the head. This makes the dance form extremely unique. The makeup is similar to that of Bharatnatnatyam. A dancer in a female role would wear a Sari with light makeup. Today the stitched costume is available. The traditional Kuchipudi was performed by all males and their attire was quite simple ‘Angivastra’ also known as Bagalbandi and a dhoti. Based on Carnatic music the language is usually Telugu. Mridangam, cymbals, veena, flute and Tambura. 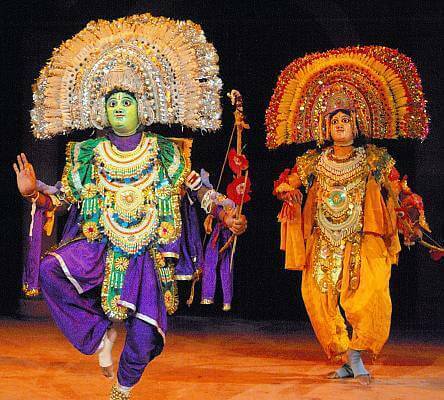 Dazzling classical dance of Kerala is Kathakali. ‘Katha’= Story or tale, ‘Kali’= Performance and Art. Its roots are in ancient ‘Kutiyattam’ (Classical Sanskrit Dance Drama) and ‘Krishnattam’ (Dance-Drama depicting Stories of Hindu God Krishna). Movements in Kathakali are influenced by ancient martial arts and athletic tradition. It is basically a Dance-Drama. Kathakali was traditionally a male-dominated dance and now females are too welcomed in this dance form. Kathakali is also famous for its huge elaborate costumes, amazing make-up style, face masks, and ornaments. Unlike other Classical Dances, Kathakali art form developed in the courts and theaters of Hindu principalities. The traditional performances were used to be as long from Dusk to dawn. Modern day presentations are short as per the time limit of the program. The Kerala Kalamandalam is the main center for Kathakali Artists. Kathakali has similarities with other dance forms like that of the Japanese ‘ Noh’ and ‘Kabuki’ dance forms have similarities with Kathakali. Mythological themes include Ramayan, Mahabharat, Bhagvat Purana, etc. Also modern day Kathakali dancers present stories and plays of Shakespeare. According to the role of the dancer, his face is colored/painted. The colors are made in rice paste with vegetable colors and applied on the face. The Green for Noble characters. Tati (Red) for evil like Ravana. Kari (black) for hunters and monsters. Another graceful Classical Dance of Kerala, Mohiniattam is Lasya inspired dance with soft, calm and gentle movements. Characterized as Feminine, usually done by women. The word ‘Mohini’ is related to the charming women avatar of Lord Vishnu – to end the evil powers. Mohiniattam also connotes, beautiful dancing women. 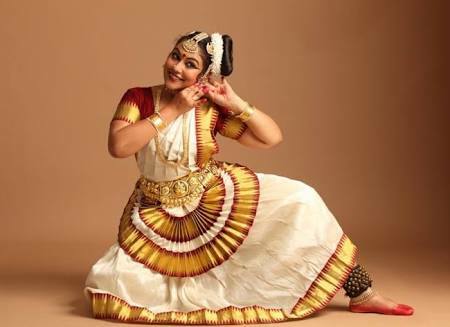 The graceful and most beautiful, Mohiniattam is mesmerizing. The text ‘Hastha Lakshanadeepika’ is followed (for hand gestures and facial expressions) that has an elaborate description of mudras. Mohiniyattam has a unique White/Off-White Costume. the prominent one-sided hairstyle (bun) also called as ‘Kuduma’. Adorable ornaments make it unique. In 1930, Nationalist Malayalam poet Vallathol Narayan Menon helped to repeal the ban on temple dancing in Kerala as well as established the Kerala Kalmandalam dance school and gave encouragement for its training and practice. Mukundraj, Krishna Panicker, Thankamony as well as Guru and Dancer Kalamandalam Kalyanikutty Amma gave their heroic contribution in reviving the traditional art form. The Manipuri dance form named after its region of origin, ‘Manipur’ is also known as ‘Jogai’. It was traditionally performed as a dance – drama on devotional songs, Manipuri showcases the love between Radha- Krishna through Raaslila. Manipuri is a combination of two culture- Indian and South-East Asian. 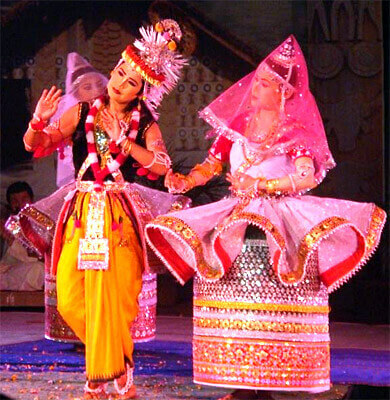 The Manipuri dance form is categorized as Tandav or Lasya. The beautifully soft and graceful dance form, Manipuri has significant movements of hands and upper body. A curvy body structure with a pleasant smile, decorative, shiny costumes, and ornaments, Manipuri is indeed a mesmerizing dance form. Another uniqueness of this dance form is that, while Ghunghroos (Bells) glorify the classical dances of India, they are not worn in Manipuri. Mostly influenced by Hindu Vaishnavism themes. It also includes themes related to Shaivism and Shaktism and regional deities. Tandav Manipuri depicts themes of Shiv, Shakti or Krishna as warrior. Lasya theme includes Love inspired stories of Radha-Krishna. Tal Rasak: It is accompanied by clapping. Danda Rasak: The synchronous beat of two sticks where dancers position creates geometric patterns. Mandal Rasak: The Gopis make a circle while Krishna attains the center. Thang ta ( a Martial art of Manipuri) etc. The expressions used in Manipuri are from the poetry of Jayadev, Vidyapti, Chandidas, Govindadas and Gyandas that may be in Sanskrit, Maithili, Brij or any other language. Pung ( A barrel Drum ) and small kartals (Cymbals) are employed in dance as well and not restricted to accompaniment alone. Other instruments include Sembong, Harmonium, Pena (String Instrument), Flute(Wind Instrument), Esraj and Shankh (conch). The female dancers wear decorative barrel-shaped drum like long stiff skirt till bottom with decorative embellishments. Dark colored velvet blouse covers the upper part of the body and a traditional veil is worn over hair that falls gracefully over the face. The male dancers adorn themselves with dhoti kurta white turban, a folded shawl over the left shoulder and the drum strap over the right shoulder. The costume for the character of Lord Krishna is Yellow dhoti, dark velvet jacket, and crown of peacock feathers. There are several private institutes as well as few Government aided centers that provide training in Manipuri Dance. The prominent among them is, Jawaharlal Nehru Manipuri Dance Academy, Imphal which is the constituent body of Sangeet Natak Akademi, Delhi. Darshana Jhaveri and many others. Sattriya is the traditional dance –drama of Assam. Sattriya was recognized in 2000 as Classical Dance by Sangeet Natak Akademi. It is influenced by Vaishnavism and the modern form of Sattriya is attributed to the 15th century Bhakti Movement Scholar and Saint Srimanta Sankaradev. Since 15th Century, Sattriya grew as a part of Vaishnav Bhakti Movement in Hindu Monasteries called ‘Sattra’. Sattras are the dance community halls (namghar) of monastery temples. Today it is popular worldwide. The themes performed are mostly on Radha-Krishna and other myths. Dramas written by Sankardev are typically presented. Sattriya performance integrated two styles: One Masculine (Paurashik Bhangi — energetic and with jumps) and Feminine (Stri Bhangi—Lasya or delicate). Both male and female perform this beautiful, expressive dance openly on the modern platform. Female—Ghuri, chadar, Kanchi (waist cloth) made up of materials manufactured in Assam. The play and Character specific costumes are also seen in Sattriya. Masks are used for special characters (like demons) sometimes. Traditional Assamese jewelry is employed. Borgeet of Sankardev and Madhavdev. Khol (two faced asymmetrical drum). Conventionally, it was only performed by ‘Bhokots’/‘Monks’ as a part of their daily rituals not before the idol but before the copy of Bhagvat Purana placed in the eastern corner of dance community hall (namghar). After the second half of the 20th century, this dance form moved from the den of Assam’s Monasteries to the modern day stage. Sattriya received patronage outside Assam and Outside India too. Sattriya Kendra Guwahati is a constituent body of Sangeet Natak Akademi established for preserving, promoting and providing training to young aspirants of Sattriya. Today Sattriya performances are a part of Major Dance Festivals in India and Abroad. The Chhau is a blend of folk, tribal and martial arts. ‘Chhau’ – is derived from the Sanskrit word ‘Chaaya’, meaning Shadow, image or mask. Also, Chhau is defined by Sitakanta Mahapatra to be derived from Chhauni ( Military Camp) in Odia language. Traditionally performed by Males – Male troupes. The Chhau has three different types originating from three different regions. Every type has its own unique feature, pattern, and style of performing and ornamentation as well. Seraikella Chhau Seraikella Kharsawan District of Jharkhand · This art form was patronized by Local administrators who themselves were dance instructors as well as skilled mask makers. · Martial Dance form performed by Men Yes. Symbolic Masks are used. Three Types: 1) Representing Human or mythological characters, 2) Represents animals and birds, 3) represents ideas and seasons like Basanta. Purulia Chhau Purulia District of West Bengal This Chhau has only one message – The Triumph of Good over Evil. Stylized, acrobatic with amazing spins. Yes , Mask represents characters from Hindu Mythology. Huge headgears are employed. Masks depend upon the role you play in the story. The music is based on folk melodies. Mohuri, Shehnai, Dhol, Dhumsa, Kharka or Chadchadi are few instruments employed to create the music. In 2010, Chhau was listed in the UNESCO’S Representative List of the Intangible Cultural Heritage of Humanity. The Government has established Government Chhau Centre in Seraikella in 1960 and Myurbhanj Chhau Nritya Pratishthan at Baripada in 1962. The Sangeet Natak Akademi established a National Centre for Chhau Dance at Baripada, Odisha. The government of India puts continuous efforts in preserving, promoting the Indian classical dances in India and abroad as well. The establishment of Sangeet Natak Akademi, Delhi and its allied centers and constituent bodies boosted the development of these classical dances. The grand Classical dance festivals like Khajuraho, Konark, Dhauli Kalinga, Kalidas, Mukteshwar, Soorya, Ellora, Nishagandhi etc., displays the beautiful representation of Indian Classical Dances. The classical dances flourished and developed further with the establishment of Music and Dance Universities like Indira Kala Sangeet Vishwavidyalaya, Khairagarh, Raja Mansingh Tomar University, Gwalior etc. and the various Institutions like Akhil Bharatiya Gandharva Mahavidyalaya Mandal, Prayag Sangeet Samiti. They not only added to the development of it but also helped the classical dance forms to reach till common people. 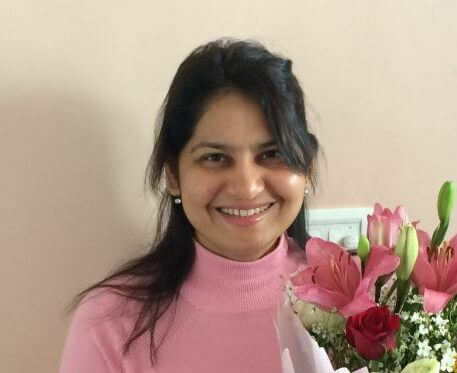 Article by: Ruhi Masodkar. The author is a Kathak dancer from Nagpur. Thank you, Piyush for the positive feedback. I found it a lot informative… one of the steps to success. what are the key points to remember mostly??????? The way you highlight the keywords is noteworthy. I really appreciate your toil. I would like to give one suggestion in kuchipudi category. Apart from the names given in masters section–mention of names such as –Padmabhushan Dr.Vempati China Satyam, Padmasri Dr.Vedantam Satyanarayana Sharma, Padmasri Dr. Shobhanaidu should find their place as their contribution is also undefinable and inexplicable. Very nice information. Good effort by Team ClearIAS. very useful article. really beneficial for us. The Best Website Ever.. Lucky I found your website.. 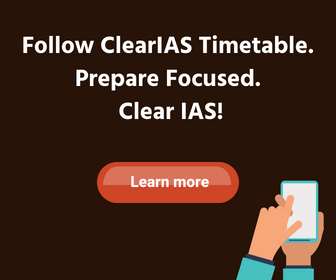 Thank You Clear IAS Team. how we can download these on line notes?? there are still 8 classical dances and you have mentioned 9. Chhau is a folk dance please correct. I want to subscribe to this site for emails. Thanks ..very informative. I have already subscribed and following this website. It has been providing quality content which is surely useful for civils and other PSC examinations. for this. I have no word to express my feelings, thank you very very very…… much. Thank You there, for giving the useful information about the Indian culture.